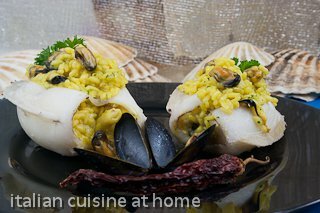 Notes to recipe: Rice filled cuttlefishes recipe is elegant and also suitable for an important dinner. Easy recipe with safron flavored risotto. In our video recipe you can also see the risotto cooking technique. You can make this modern Italian recipe also with frozen cuttlefishes.